The healthy foot is made up of 26 bones, although it is not uncommon for individuals to have additional small bones called ossicles. The foot bones are divided into 3 sections (hind, mid, and fore foot). 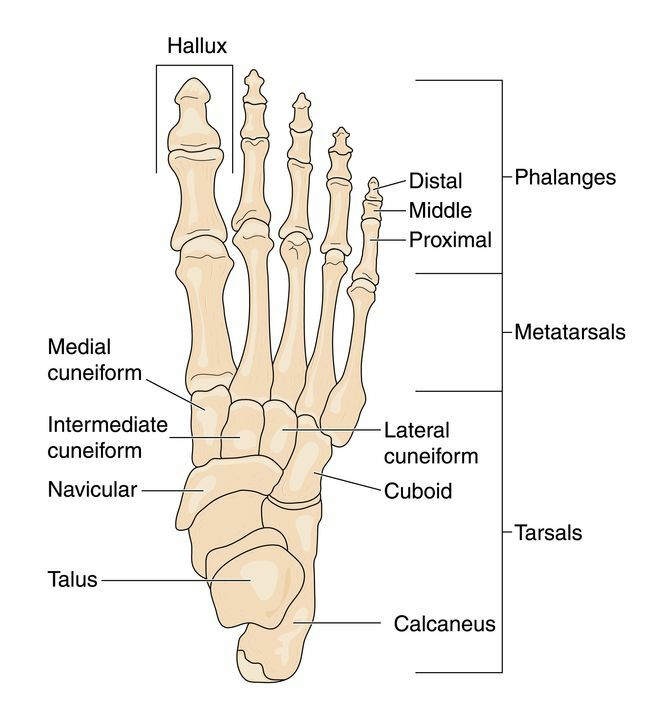 The hind foot is composed of the talus and calcaneus (heel bone). The mid foot is composed of the small, irregularly shaped bones between the hind foot and long foot bones (see the pic above). That leaves the long foot bones, pad of the foot, and toes for the fore foot. Each bone has protective Articular Cartiledge cushioning it from rubbing directly against other bones. It allows the bones to move smoothly. It is elastic enough to act as a shock absorber and tough enough to last through a lifetime of regular use. Unfortunately, if it’s injured the healing process can be long due to limited blood flow and slow regrowth. For more information try looking at the Orthopod page on ankle anatomy. The healthy ankle is a joint consisting of three bones, wrapped by ligaments and cushioned by thick cartilage. The three bones that form the ankle are the fibula, shinbone (tibia), and talus. 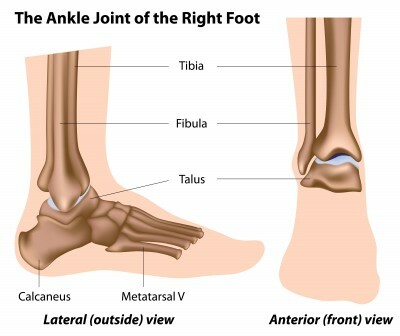 The fibula and tibia make up the lower leg and their lower edge forms the top portion of the ankle. They rest on the talus, which is the uppermost bone of the foot.